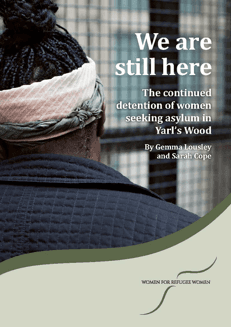 IDC Member organisation, Women for Refugee Women have released a new report: ‘We are Still Here: The continued detention of women seeking asylum in Yarl’s Wood’ which examines the experiences of women detained at Yarl’s Wood immigration detention centre in the UK and assesses the effectiveness of the “Adults at Risk” policy. Following the findings of the Shaw review findings, the UK government introduced the “Adults at Risk” policy in 2016. The policy was intended to reduce the number of vulnerable people detained and a reduction in the duration of detention before removal. The policy recognized that people who are vulnerable or particularly ‘at risk‘ (including survivors of sexual or gender-based violence and pregnant women) may be particularly susceptible to harm in detention and therefore they should normally not be detained. The 35-page report is based on interviews with 26 women who have claimed asylum and been detained in Yarl’s Wood since the Adults at Risk policy came into effect. The report states that despite what the government promised, the Adults at Risk policy is failing to safeguard and protect survivors of sexual and gender-based violence from harmful immigration detention. Survivors of sexual and gender-based violence are routinely being detained: 22 of the 26 women (85%) interviewed, who had claimed asylum and been detained since the Adults at Risk approach came into effect, reported they were survivors of sexual or other gender-based violence, including domestic violence, forced marriage, female genital mutilation and forced prostitution/trafficking. Women who are already vulnerable as a result of sexual and gender-based violence are becoming even more vulnerable in detention: All of the women interviewed aid they were depressed in detention, and 23 of the 26 women (88%) said their mental health had deteriorated while they were detained. Survivors of sexual and gender-based violence are being detained for significant periods of time: The lengths of detention for the women interviewed ranged from three days to just under eight months. The vast majority, 23 out of 26 women were in detention for a month or more. Nineteen women were in detention for three months or more. Pregnant women are still being detained unnecessarily: Figures Women for Refugee Women have obtained indicate that, under the 72-hour time limit, the number of pregnant women detained has fallen noticeably. But the majority of these women are still being released back into the community to continue with their cases, as was happening before the time limit was introduced: fewer than 20% of pregnant women who are detained are removed from the UK. 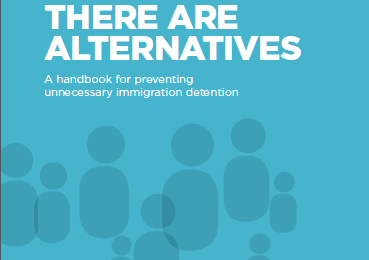 The report dedicates a section to alternatives to detention, highlighting that alternatives to detention (such as case management) avoids harm of detention, and promotes the wellbeing of those going through immigration and asylum systems. The report notes there is a wealth of international evidence demonstrating that alternatives to detention are more humane, more effective, and cost less than detention. The report makes several recommendations, placing emphasis on the need for alternatives to immigration detention. The first recommendation calls on the UK government to work with the voluntary sector to develop and implement alternatives to detention, focused on support and engagement. IDC Member, Women for Refugee Women is a UK-based organization, which challenges the injustices experienced by women who cross borders to seek safety. Women for Refugee Women work at the grassroots to support and empower women seeking asylum and sharing their experiences through the arts, media, public events and research. Women for Refugee Women also leads the Set Her Free campaign to end the detention of women who seek asylum in the UK. 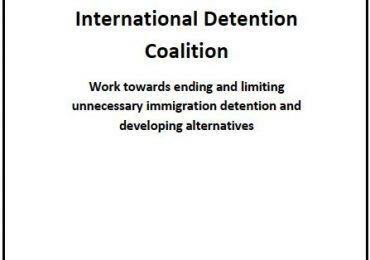 The IDC is one of many organisations that promote alternatives to detention. The IDC has identified over 250 examples of alternatives from 60 countries and the benefits in restricting the application of detention. The IDC’s handbook There Are Alternatives provides readers with the guidance needed to successfully avoid unnecessary detention and to ensure community options are as effective as possible.